There are advantages and disadvantages on both sides of the coin. 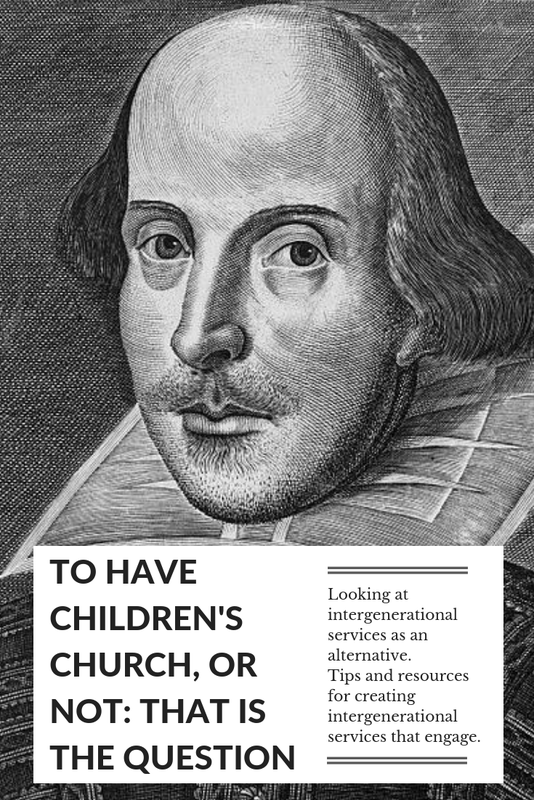 My purpose of this article is to explore churches that provide alternatives to children's church, not to say that it is the way to go. A few weeks ago we visited Duke Chapel at Duke University while on a medical leave here in North Carolina. Let me caution you, this is not the type of church I normally attend, but for the purposes of this article, their doctrinal statement, or lack thereof, does not have any bearing. Upon entering the foyer of the chapel we were greeted by a table with a box of children's bags and clipboards with children's bulletins on them. I know that a lot of churches use some form of these. I videotaped the bags at Duke so you could see one. Children's Worship Bags from Joan Eppehimer on Vimeo. 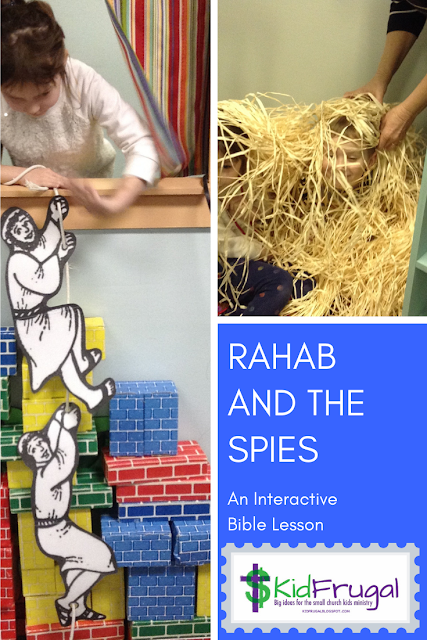 This idea is more of something to engage children during the service, rather than helping them to interact with the service, but it still has its merits. And I have heard that many children will actually be listening to a sermon while coloring a picture, or playing with a toy, so don't discount this idea totally. 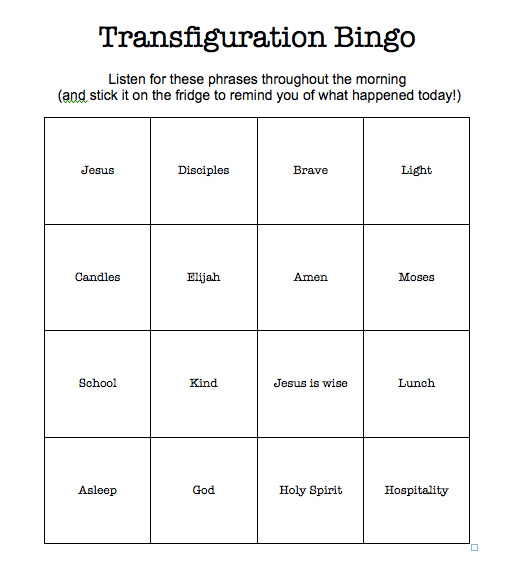 I think this idea is super, but I can just see an exuberant child forgetting all decorum and yelling out, "Bingo!" during the service. All kidding aside, this seems kind of fun and engaging at the same time. 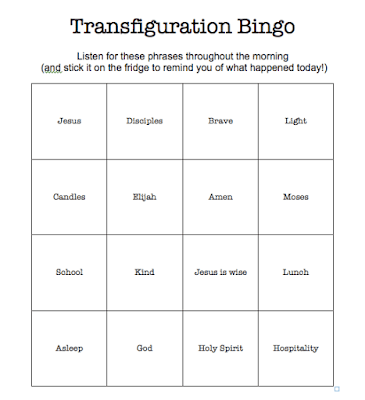 Not having tried this tactic, I cannot say for sure, but I would put words from the sermon into a bingo generator. This site can make up to 75 different cards off of one sermon. You can also put words from the other parts of the service into the grid. This might be especially nice if you have a more liturgical service. There are a lot of generic ones on line. 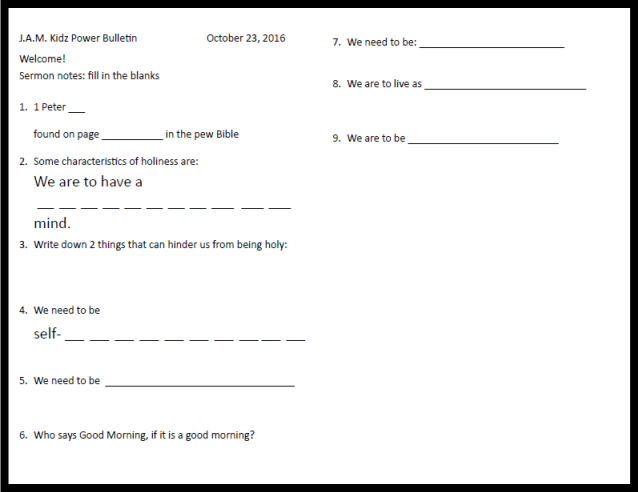 I know someone who has the children turn their bulletins in after the service and she posts them on a special bulletin board for all to see. This gives the kids a sense of pride and it helps the rest of the congregation to connect with the kids. 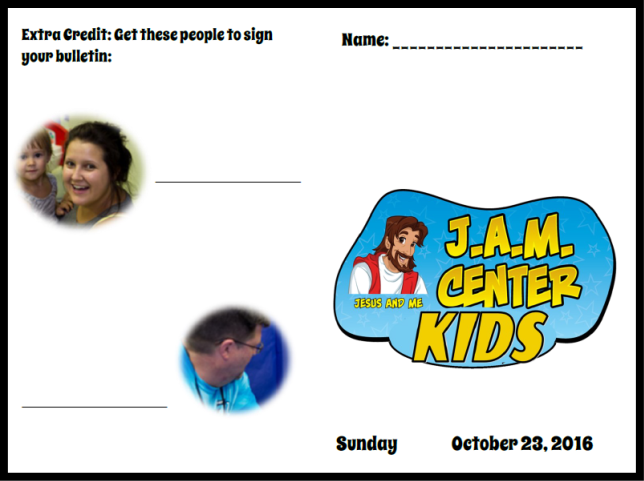 I even had guest speakers give me questions or outlines of their sermons to use in our children's bulletins. If your Pastor is very visual, he or she can probably figure out an object lesson or some sort of visual aid to illustrate one or more points in the sermon. Even using pictures on the Powerpoint can help keep kids (and adults) engaged. We had one speaker who brought a suitcase with him and unpacked it during his sermon. He was actually illustrating the incarnation - how Jesus came to earth. In the suitcase were things to explain this, and the suitcase demonstrated that Jesus made a trip to get here (sort of). Use pictures from children's books or movies kids might be familiar with that fit your point. Use the congregation as props or actors. 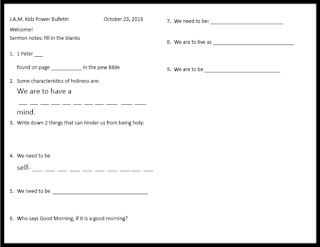 An activity that would demonstrate a sermon point. You have probably seen this done in youth services where kids write something down on a post-it note and place it on a board. Just make sure you offer options that are doable for all ages. Props (as mentioned above in the suitcase example). You can probably google ideas if none come to you. If you are seriously considering going with an intergenerational service, I have included some links below for further help. Even just offering such a service once a quarter might be refreshing for everyone. Parenting in the Pew by Robbie Castleman. This book contains ideas, challenges and examples of ways you can help your children learn to worship God and participate in the worship service. All Age Worship Resources - this is a British web page, but there are excellent resources on it. Do Not Hinder: Welcoming Kids to Worship - using Jesus's words in Mark 9:36-37 the author makes an excellent point that "whoever welcomes one of these little children in my name, welcomes me;" refers to our congregations. Very motivational article. Google "intergenerational church worship service" and you will find lots of other ideas. Have a good idea? Please share it with us.